Diagram numbers were the original means of classifying different wagon designs by BR. As the name suggests, diagrams were actually drawings of wagons, showing the general configuration but omitting detail such as the underframe layout. Each drawn diagram was inserted into a diagram book and given a page number, by which it would then be refered. Any orders for wagon construction would be to a particular diagram (or in some cases more than one diagram), and the lot and stock numbers were generally added to the information on the diagram. Diagrams were kept in a series of books. Book 1 was for normal and departmental wagons, book 2 for specially constructed wagons and book 3 for containers. Book 6 seems to have been used for private owner wagons but I have no information as to whether books 4 and 5 were used. To avoid confusion, from the 1960s references to particular diagrams included the book number seperated by an oblique and this convention is used throughout this site. For example 1/038 refers to diagram (page) 38 in book 1. Page numbers were not issued in sequence, an attempt being made instead to group similar types together. 1/100 and upwards were mineral wagons, 1/140+ being coal hoppers, 1/200+ vans and so on. Steel-carrying wagons were all given page numbers in the 400 series, while brake vans and departmental wagons were from 500 upwards. This scheme fell apart somewhat as more and more designs were introduced, with out of sequence gaps being filled in when the original blocks were exhausted. Significant conversions and modifications to wagons also often (but not always) resulted in the issuing of a new diagram. There were cases of diagram numbers being reissued for other uses, and of particular designs having their diagram number changed. As this website focuses on the post-TOPS wagon scene, these will not be covered in any great detail. A list of diagram numbers in books 1 and 2 was included in 'BR Wagons; A Numerical History � Volume 1' published by HB Publications in 2007, while a more detailed list including book 3 formed an appendix in 'BR Wagons � The First Half Million' (Don Rowland, David and Charles, 1985). With the advent of TOPS, design codes replaced diagram numbers as the means of categorising the configuration of wagons. Design codes were tied to TOPS codes and conveyed a lot more detail by allowing for both different designs and variations within each design. The format of a domestic design code is AB001A (RIV wagons have a different series, discussed later) where AB are the first two letters of the TOPS code, 001 the sequential design, and A the variant. In most cases, the design series started at 001 and progressed numerically. Wagons built for departmental use started at 500. Similarly the base variant would be A, with subsequent letters used for further variations. Although the TOPS code brake type was not part of the design code, it is believed that a seperate design code would have been issued for each brake type on a particular design. 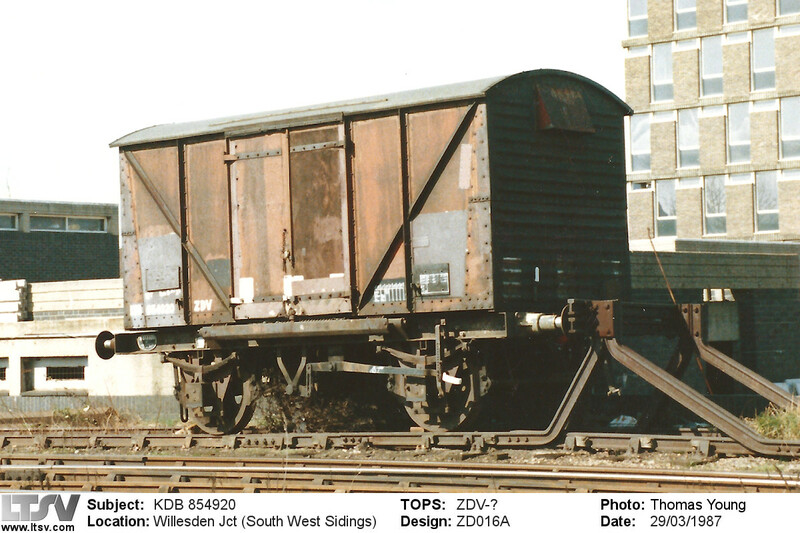 Looking at some specific examples, BA001A covered the BAB wagons that were the first built. When the build switched to un-piped BAAs, new design code BA001B was issued. Later in the production run the configuration of the end stanchions was changed, resulting in the issuing of BA001C. 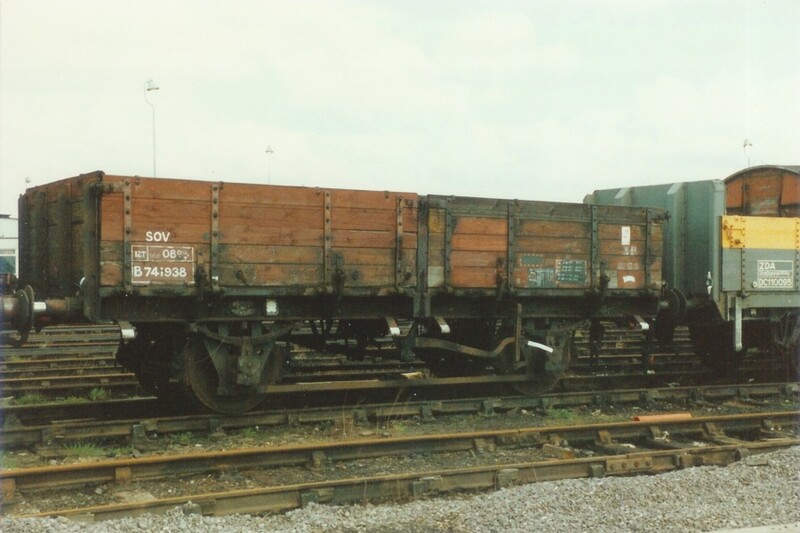 The last 32 wagons had more significant differences in the ends (and the shape of the solebars) and this caused the issue of a new series with BA002A. In service modifications involved the issue of subsequent codes BA001D through to BA001L and BA002B. RIV wagons differed in that they were given diagram numbers in a sequential E-prefixed series. By 1999 the sequence had reached the mid 800s. Design codes were formed of the first two letters of the TOPS code followed by the diagram number. As an example, KYA nuclear flask carrier 33.70.9985.003 was to diagram number E848 and had a design code of KYE848. See here for more information. Design codes are particularly useful when looking at types where a single TOPS code covers numerous variants. Private owner hoppers in the PGA are to a variety of designs and a PG006A is quite different to a PG010A. As with stock numbers, design codes are not generally reused. A good example of this is the fleet of FSA container wagons introduced in 1991, which were given code FS002A. TOPS code FSV had been reserved for the 100 Lowmac wagons modified to carry ISO containers in 1966, even though these were all out of use by the time TOPS was introduced. These took codes in the series FS001A etc and, despite the gap of almost 20 years, the code was not reused. Whether this still applied across the TOPS series that have seen a change of use (such as the Kxx series that was originally '2-axle coil wagons' and later 'specialist privately-owned wagons') is not clear. On the other hand, some codes were reused. As an example, the HAA wagons with canopies were recoded as HCA in 1990/1991 using design codes HC001A and HC001B. These had earlier been used for coke hoppers, all of which were withdrawn by the early 1980s. A curious aspect of design codes is the carrying over of variations even if no longer relevant. Two wagons rebuilt to an identical design will have different design codes if the wagons they were converted from had different codes. A good example of this was quoted by Bob Wallace in Rail magazine in 1993 and concerned the rebodying of VDA vans as ZCA Sea Urchin open ballast wagons. Some of the source wagons had earlier been recoded VD001F to indicate the addition of small cupboard to the van end, the standard wagons being VD001A. Although any physical trace of the differences would have been lost with the rebodying, ex VD001As became ZC014A while the VD001Fs became ZC014Bs. This also illustrates that departmental conversions took design codes numbered from 001 upwards rather than 500. There were some instances where the number of variants of a given design required the issuing of more than one design code series. The fleet of Salmon bogie rail wagons had numerous detail differences and their design codes started at YM500A. It would appear that all the letters up to YM500Z were issued (probably with I and O omitted to avoid potential confusion) and that this was followed by YM501A and upwards. This appears to be the only limitation of the design code scheme. For example, if PG019 and PG020 were two distinct designs, but the PG019 variations ran to more than 24, they would have to jump to the next available series. It is likely that some design codes may have been issued but not used, particularly in the cases of aborted conversions. Unlike diagram numbers there are no available listings of design codes, understandable when you consider that several thousand have been issued. The datasheets on this website will list those that are known. Shock van B854920 was built in 1958 to diagram 1/218. Under TOPS it would have been recoded as a VSV but by 1987 it was in the Signal Engineers fleet as a ZDV to design code ZD016A. Pipe wagon B741938 was built in 1961 to diagram 1/462. Under TOPS it became an SOV, to design code SO001H. PR3005 was built to private-owner diagram 6/455 in 1974, this soon changing to design code PX030A and TOPS code PXA. In 1985 it was rebuilt as a scrap metal carrier with a new design code of PX030B. Under the TOPS changes of 1990, it was changed to a JXA to design JX030B and later JX030E following further modifications. Page added: 19/04/2008 Spotted an error? Got some additional info?